What makes most golfers miss a fairway off of the tee? There are two reasons; one is the length is too long and the other it is too lightweight. Drivers today are all increasingly longer in length and lighter weight than they were a few years ago. Why? Because the marketing departments of large golf club manufacturers try to entice players to want to hit longer drives just like the touring professionals that play with their equipment. Only problem is that 99.9% of all golfers lack the ability to hit the ball on the center of the clubface when it is square to the target. The manufacturer wants players to think that their golf skill is the same as a touring professional. And that my friends, is how the large golf companies make money! However, those players who realize the absurdity of this practice come to us for help...and we show them the Ultimate Thriver. The XV Ultimate Thriver is a full 10 to 20 grams heavier than a normal driver to allow from anywhere between 1 to 2 inches shorter for a more controllable playing length that now has the proper amount of weight in their hands. 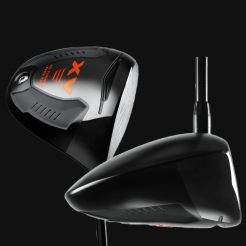 The addition of the weight produces even greater forgiveness making this the ultimate in control off the tee. Plus having more weight in the head will transfer more momentum to the ball and establish a better swing tempo. It features a superlite all-titanium crown which is accomplished through a CNC milling process to remove excessive reduce weight which is then re-positioned strategically within the head for optimal performance. In addition, the Gravity Weight Port that is utilized for fine-tuning swingweight. It can also allow for the club to be built with a shorter shaft length for more control and accuracy.